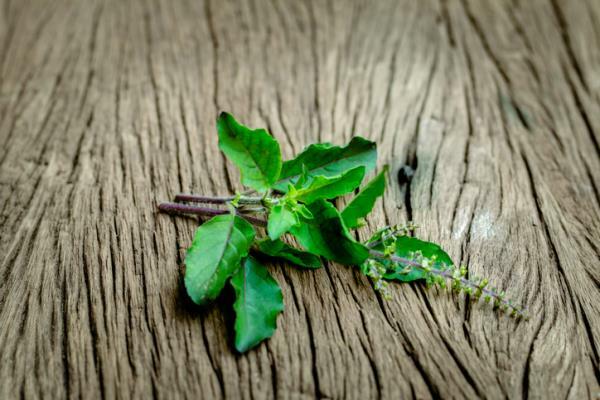 Holy Basil is an important herb in medicinal folklore throughout Asia. In India this herb, Ocimum sanctum is called Tulsi. It has numerous proven properties. * Research has shown that Holy Basil is a COX-2 inhibitor and possess anti-inflammatory, anti-pain and analgesic properties. * It also prevents and reduces symptoms of stress and as such it has been dubbed a primary adaptogen, protecting the body from itself. * It can reduce the risk and symptoms of diabetes, protect the liver and reduce blood fat levels. * It also has important immune boosting and immune-regulatory powers. Holy Basil contains a number of bioactive phytochemicals: for example, apigenin, eugenol, rosmarinic acid, myretenal, luteolin, β-sitosterol, ursolic acid and carnosic acid. Various studies have shown their epigenetic effects with cancers like lung, pancreatic, breast, prostate, oral and skin cancer. They have been shown to perform a variety of anti-cancer functions – for example, they increase antioxidant activity, alter gene expression, induce apoptosis, and inhibit angiogenesis and metastasis. One study showed Holy Basil could attack pancreatic cancer cells and tumours in both the laboratory test tubes and also in mice given the cancer(1). Perhaps the most interesting ‘ingredient’ is ursolic acid which comprises approximately 2 per cent of the leaf. In 2015 it was reported that ursolic acid caused autophagy (where cancer cells attack each other) and reduced tumour growth in cervical cancer. The result was dose-dependent (2). The same year it was being shown to attack prostate cancer and could sensitise the cancer cells to a greater attack by TRAIL drugs. In the same way it was shown to attack colorectal cancer cells and could aid CHOP drugs(3). By 2017, an overview against all types of breast cancer (ER+ve, TNBC, ER-ve, HER2 etc) showed that ursolic acid damaged the glycolytic pathway in cancer cells and specifically the AMPK pathway in cancer cell mitochondria causing cell cycle arrest, DNA damage and cell death. Because it sensitised breast cancer cells it also seemed to increase the performance of standard chemotherapy(4). Then research showed that ursolic acid could work with either/both curcumin or resveratrol to kill prostate cancer cells in vivo and in vitro. Go to: Three natural compounds effectively fight prostate cancer. Ursolic acid is also found in apple skins, pomegranate and pistachio nuts. Finally, there is research that suggests Holy Basil could be a really effective agent in protecting healthy cells during chemo- and radiotherapy(5). "if you are already thinking of supplementing with these natural compounds you may like to see what ournaturalselection has to offer by clicking here."